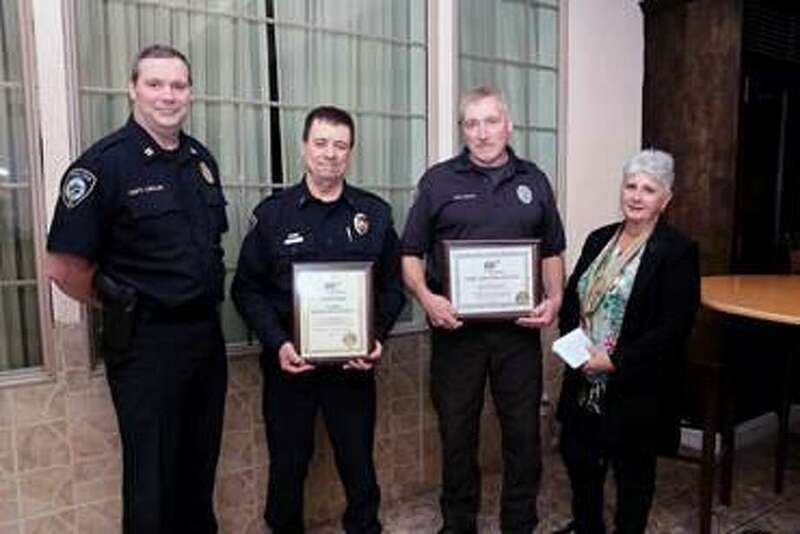 At AAA’s 9th annual Community Traffic Safety Awards lunch recently at Testo’s in Bridgeport, AAA Public Affairs Manager Fran Mayko, right, presented awards, from left, to Capt. John Lawlor, Chief Ray Osborne and Officer T. Court Isaac, of the Darien Police Department. AAA Northeast recently honored the Darien Police Department with a Gold Award for the department’s traffic safety programs. In addition, the Hamden-based auto club recognized officer T. Court Isaac, a AAA driving improvement instructor, as a AAA Traffic Safety Hero. Isaac teaches driver improvement classes to senior drivers at the police department. He also is very much engaged with the youth of Darien where he is involved with SADD — Students Against Destructive Decisions — and attempts to educate youth about the dangers of underage drinking and driving. A department motor officer, Isaac also directs Operation DHS, a program that notifies school officials of moving violations by students traveling to and from school, and the “Cops & Kids” middle school adventure program that focuses on driving and school bus safety. Isaac was recently presented with the award at AAA’s ninth annual Community Traffic Safety Awards Ceremony. Weekend performances of award-winning Nashville and Pedal Steel Guitar artists include a Nov. 17 show at the Piedmont Lounge in Darien and the 45th annual Pedal Steel Guitar Association Show on Nov. 18 at the Doubletree Hotel in Norwalk. Proceeds for both shows will go to the Pedal Steel Guitar Association. The annual Pedal Steel Guitar show features performances by Jim Cohen, Eddy Dunlap, John Eichleay, Jerry Fessenden, Raphael McGregor, Tom Riley, Steel Guitar Hall of Fame member Joe Wright, and original Asleep at the Wheel member and Grammy-award winner Lucky Oceans. Visit psga.org for a full schedule of performances which take place from 11 a.m through 6 p.m. Admission is $25. Dunlap, Oceans and Wright will perform with award-winning Nashville recording artists and local country western band Gunsmoke at the Saturday show starting at 8 p.m. Admission for the Saturday show is $7. The Doubletree Hotel is located at 789 Connecticut Ave. in Norwalk. The Piedmont Club is located at 152 Hecker Ave. in Darien. For the second year in a row, Darien and New Canaan will face off to see which town can capture the title of “Most Generous Town” by raising the most funds for either The Community Fund of Darien or the New Canaan Community Foundation. Last year, Darien won by a slim margin, and both organizations collectively raised nearly $70,000 to support local nonprofits. This year, the competition window extends from the Turkey Bowl on Thanksgiving Day until midnight on Nov. 27. Donors can contribute to The Community Fund of Darien by texting 06820 to 44321 during this time period or by visiting www.communityfunddarien.org any time of year. The winning town will own the “Turkey Trophy” and bragging rights for the year, and their residents will take pride in the knowledge that their community makes charitable giving a priority. Inspired by Giving Tuesday, the post-Thanksgiving global day of giving that kicks off the holiday charity season, the two organizations created the event as a way for the towns to harness their residents’ competitive spirit to benefit our neighbors in need. Many local businesses will be donating a percentage of sales from that day to The Community Fund of Darien. The Darien Community Association will host a book talk on and signing with Jennifer Egan, Pulitzer Prize winner for “A Visit from the Goon Squad,” on Dec. 4 at 7:30 p.m. Her latest novel, “Manhattan Beach,” is 2018’s One Book, One New York winner. “Manhattan Beach,” a Wolrd War II-era novel, tells the intertwined stories of Anna Kerrigan, a Brooklyn Navy Yard diver, her father Eddie Kerrigan, a longshoreman turned small-time gangster, and Dexter Styles, Eddie’s inscrutable and connected boss. This event is held in conjunction with Barrett Bookstore. Signed copies of “A Visit from the Goon Squad” as well as signed hardcover copies of “Manhattan Beach” will also be available for purchase. This event is $60 for DCA members or $85 for nonmembers. Ticket price includes a signed paperback book and a glass of wine. Payment is required by Nov. 30. Register online at dariendca.org or contact the DCA at info@dariendca.org or 203-655-9050 ext. 10. The third annual Mother/Daughter Nutcracker Tea will be held at the Darien Community Association mansion on Dec. 2 from 11:30 a.m. to 1 p.m.
A menu, provided by Palmer’s Catering, will include traditional tea sandwiches (such as smoked salmon and caper), long-stem strawberries dipped in dark chocolate, holiday cookies and assorted teas. For the children, festive sandwich cut-outs and raspberry lemonade will be served. Dancers from the Darien Arts Center will entertain the audience with abbreviated scenes from the “Nutcracker,” and DCA Blue Notes will lead a caroling sing-along. Fees are $35 for children and $45 for adults. Payment is required by noon on Nov. 28 and may be made online at dariendca.org or by contacting the DCA at info@dariendca.org or 203-655-9050 ext. 10.